Same as last year, the 2019 small agenda refill has silver page gliders. This came with a dust bag and Louis Vuitton box drawer. I got my agenda refills for SGD 71 at Louis Vuitton, ION Orchard. This time, I purchased the diary version only (the actual weekly pages) instead of the complete version that includes a phone book, a booklet with the maps of the world, and pages for monthly calendar view. Nothing has changed for the paper quality in this year’s refills. The cream-colored pages are still of high quality, despite having thin leaves and print peeking through the pages. The page for basic personal information (address, contact details, and email) follows after the cover page. This year’s theme is described in different languages and depicts how the monthly illustrations came to life. In addition, a single page for notes is available at the beginning of each month. In my experience using my LV PM agenda (or small agenda), I use these pages to write down topics and blog ideas. La Route de L’Alzer illustrates the destination of the iconic LV travel piece, as it journeys from one Louis Vuitton maison to another. It starts in Paris and ends in Paris, too. The maisons are found in Asnières-sur-Seine, Paris (January), Champs-Élysées, Paris (February), Canton Road, Hong Kong (March), Omotesando, Tokyo (April), Grasse, French Riviera (May), Ipanema, Rio de Janeiro (June), Marina Bay, Singapore (July), 5th Avenue, New York (August), Place Vendôme, Paris (September), Dubai (October), Miami, Florida (November), and back to Asnières-sur-Seine, Paris (December). Can you spot the Alzer in each illustration? Nothing has changed on the actual diary leaf. The week on two pages still features a schedule entry that starts at 8:00 and ends at 19:00 on weekdays, and no time indicated on weekends. I personally don’t mind these time entry, so I just list down whatever task I need to do for the day. The writing space of 3mm is also not enough to write down an entire schedule (unless you put them in code). An additional writing space at the end of the week is helpful for detailed notes or any other important to-do list. Additional pages were made available after La Route de L’Alzer, including a few leaves for Temps Pour Soi (directly translated to “Time for Yourself”) which is actually a section for extra notes. The note pages in the diary only version are lesser than the complete one. I never touched any of these sections when I was using my LV PM agenda refills last year. Aside from the paper quality and the yearly themes, I like purchasing Louis Vuitton’s agenda refills because it comes with extras. Last year, the refills include sticky notes, while the 2019 version contained stickers. I’m not sure what to do with them though, as I like to keep my agenda neat and professional. I still prefer the sticky notes, but I still have them from last year’s edition. What I’m hoping that LV would bring back is the plastic ruler which can double as a bookmark or page marker. As mentioned in my previous LV Agenda PM review, I bought the complete version because the monthly calendar view is a deal breaker for me. It still rings true, but I can no longer justify paying an additional SGD 30+ for the monthly calendars. So while the monthly calendar pages are important for me, I still chose the week on two pages diary version only, and then purchased another cheaper agenda refill alternative from a different brand. 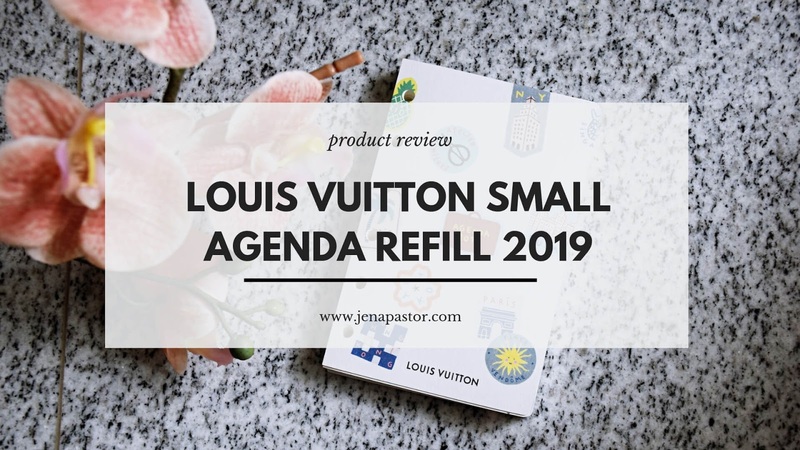 For a detailed review of the pros and cons of the Louis Vuitton PM agenda refill (complete set), click here. Will you purchase this year's refills from Louis Vuitton?